I have an app which returns data in the form of a table copied into the clipboard. I'm looking to pull back only the heading and data rows, minus the horizontal rows which are represented by dashes (---) in my data. 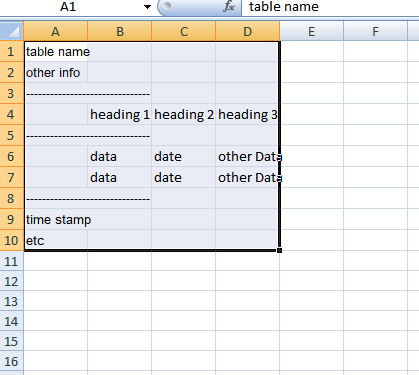 I need the pipes (|) as they are used to split the rows for passing back to excel. There may be better ways to accomplish your overall goal, but this accomplishes what you requested. Const sPat As String = "^(?:(?:(?:(?=-).)+)|(?:[^|]+))\n?" Hi @tsuimark have you treid copying Clipboard data to directly to excel.? tried and attched screenshot. and remove unwanted rows in sheet. Not the answer you're looking for? Browse other questions tagged regex excel vba or ask your own question.